Like a veteran character actor, L.A.’s Second Street Tunnel is instantly recognizable even if few know its name. It’s played supporting roles in uncounted films. It’s had bit parts in even more car commercials. Drive through the tunnel at night, and you’ll see why. Light dances across the tunnel’s glazed white tile, whatever the source—an alien fireball in Independence Day, the taillights of Decker’s car in Blade Runner, or the LED headlights of the latest Audi sedan. Of course, it was not built for film and TV production. When the city first approved its construction in 1916, the tunnel was seen, optimistically, as the solution to downtown’s traffic woes. It promised to pierce directly through Bunker Hill, which stubbornly stood between the city’s central business district and booming residential districts like Hollywood to the northwest. It would also, it was hoped, relieve pressure on the older and shorter Third Street Tunnel one block away. Delays plagued the tunnel’s construction, the start of which was itself stalled five years by litigation. Steam shovels didn’t begin tearing into the hillside until April 11, 1921. Less than a year later, the contactor quit. A new one (with an ironic name, James Hill) resumed work, but an unusually wet winter slowed progress. Then a minor cave-in rattled the foundations of the houses atop Bunker Hill above. For a time, it seemed the tunnel would never open; it became the laughingstock of the city. But by July 25, 1924, workers had finally bored 1,502 feet through Bunker Hill’s shale and sandstone. Speeches were kept short at the dedication ceremony, at the end of which a parade of automobiles plunged into the eastern portal. The tunnel’s glossy tile shimmered with headlights for the first time. 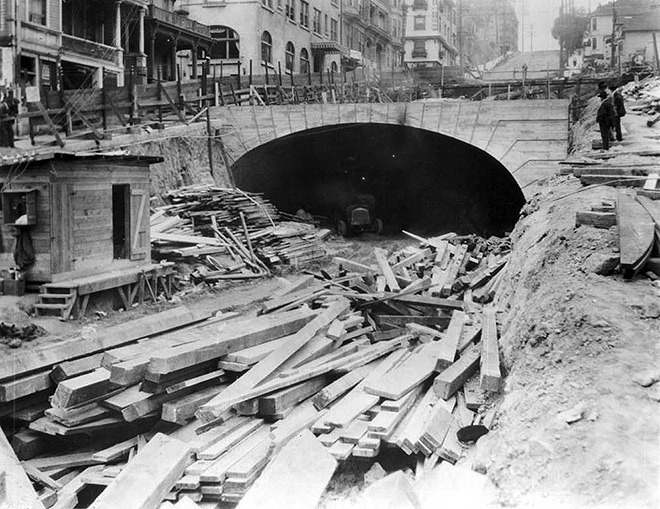 Above: The eastern or Hill Street portal of Second Street Tunnel under construction, circa 1921-24. Courtesy of the USC Libraries – California Historical Society Collection. Nathan Masters of the USC Libraries blogs here on behalf of L.A. as Subject, an association of more than 230 libraries, cultural institutions, official archives, and private collectors hosted by the USC Libraries and dedicated to preserving and telling the sometimes-hidden histories of Los Angeles.